This is a follow up post from the one I ran yesterday. Thank you for all the lovely comments, especially if I didn’t get a chance to reply. I have to admit, that I’m more than a little bit in love with this dress myself, so I can totally understand why many of you want to know more about it. I thought I’d share my process of creating the pattern. Firstly, here is a picture of the dress laid flat. 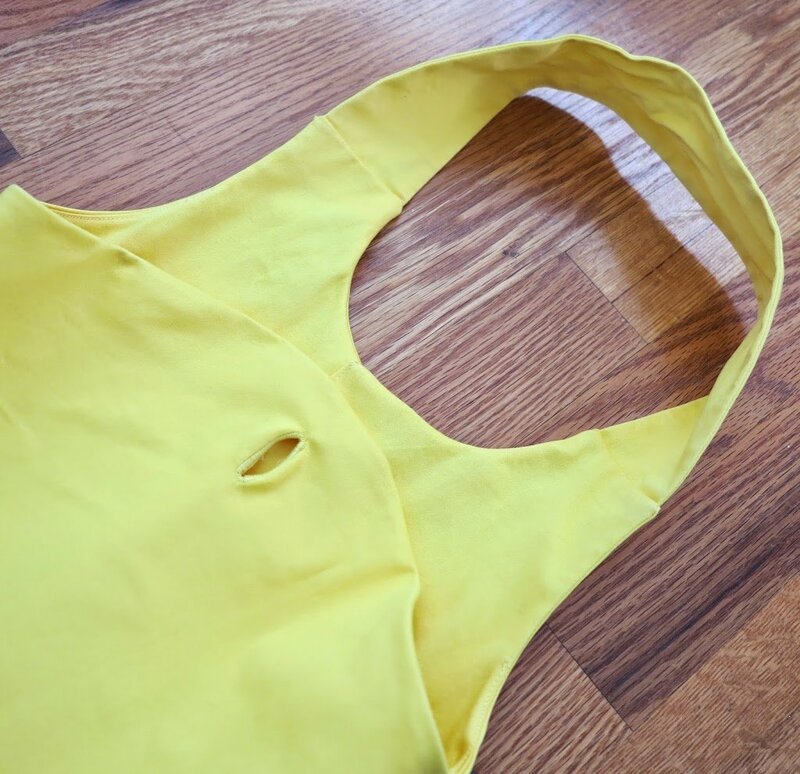 You can see the buttonhole in the bodice and how the back strap is connected as one piece. The ‘bow’ is to the right. The portion of the back strap that I’m holding between my fingers is the amount that passes through the buttonhole. 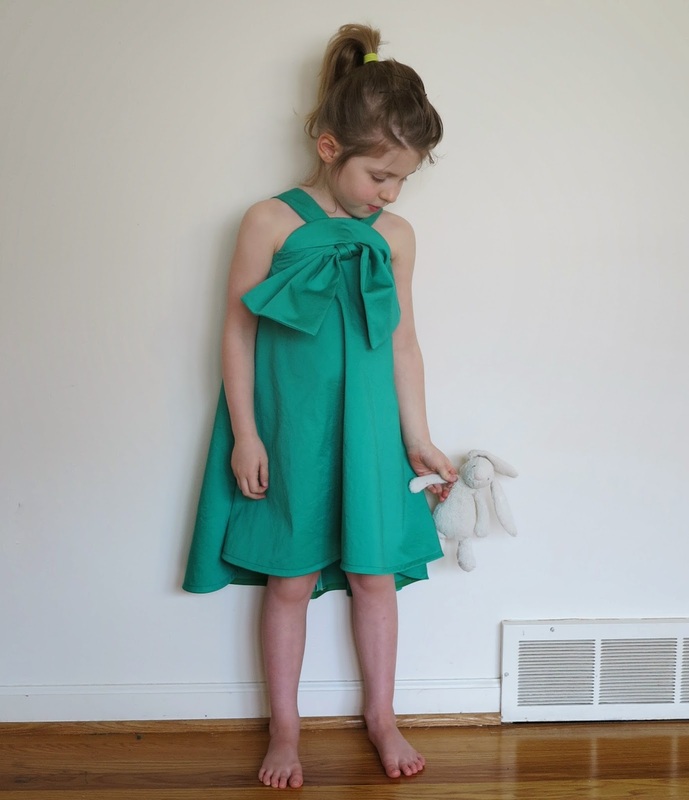 The fabric I used for this dress was a thick cotton sateen (doubled up both ways because of self-fabric lining). My bow was also quite wide. 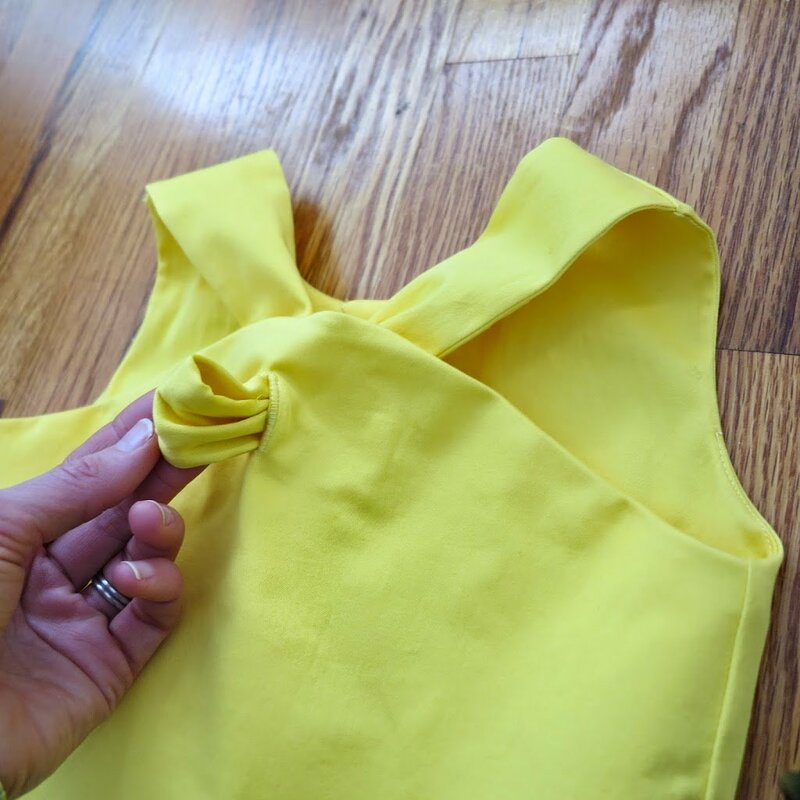 The bulky amount of thick fabric that needed to wrap around the bow fabric on the outer side of the buttonhole meant that I needed to allow for 2-3 extra inches of length in the back strap. If I was using silk CDC (a thinner, lighter fabric), I could have shortened the strap. 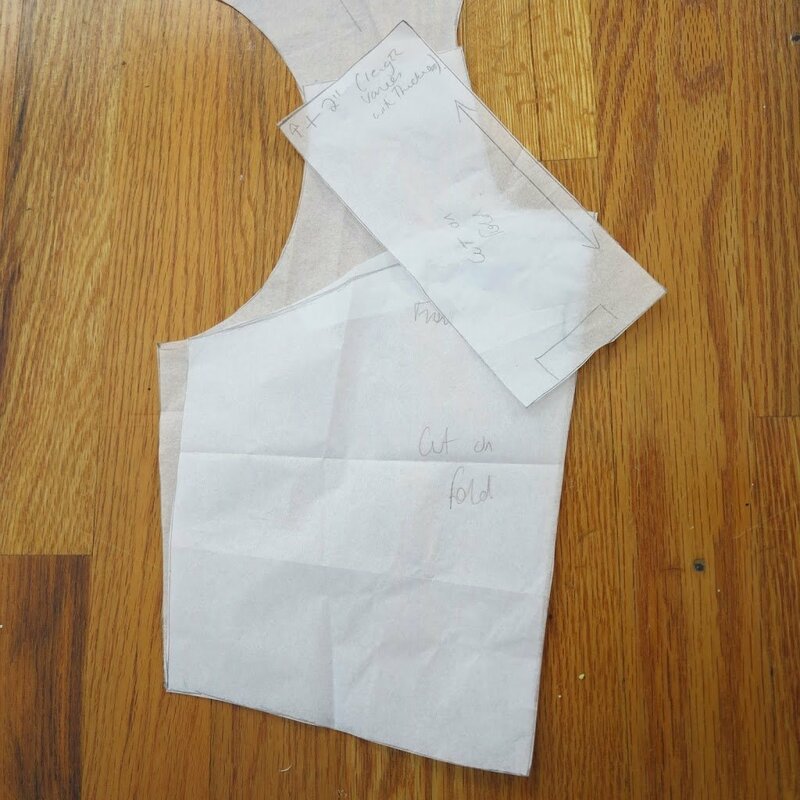 And now for how the pattern pieces look, and how I created this design from a basic bodice sloper. 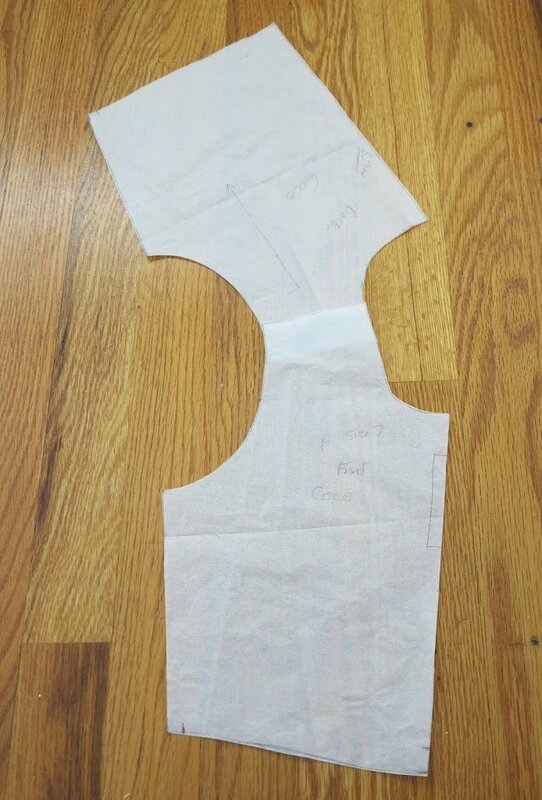 In the picture below, I’ve overlapped the seams of a basic front and back bodice piece. This is what I started with. 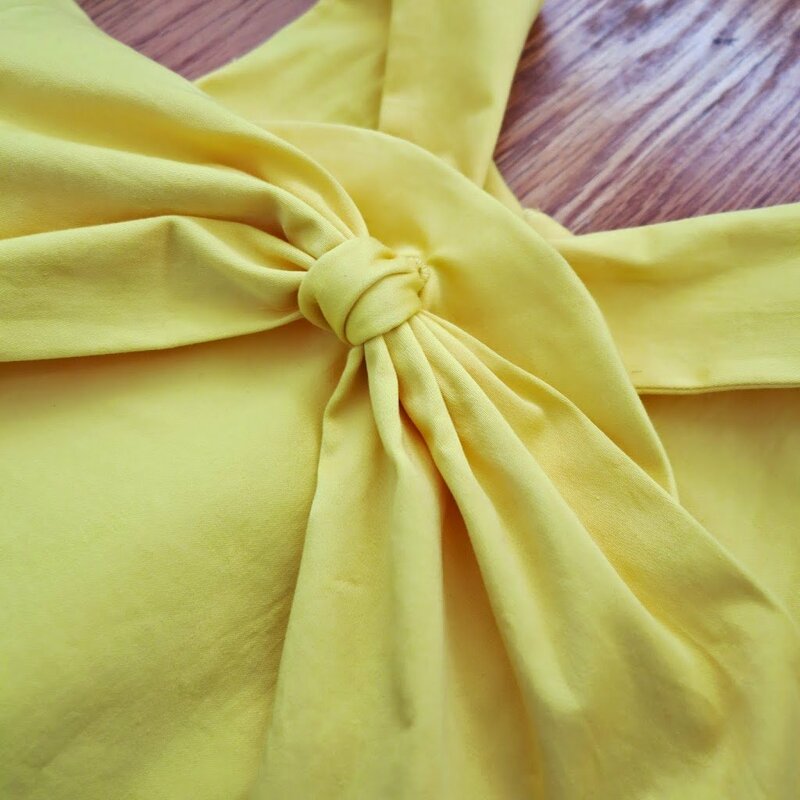 I made the basic dress sloper up in a muslin first to see where I wanted the top of the bodice to reach to. 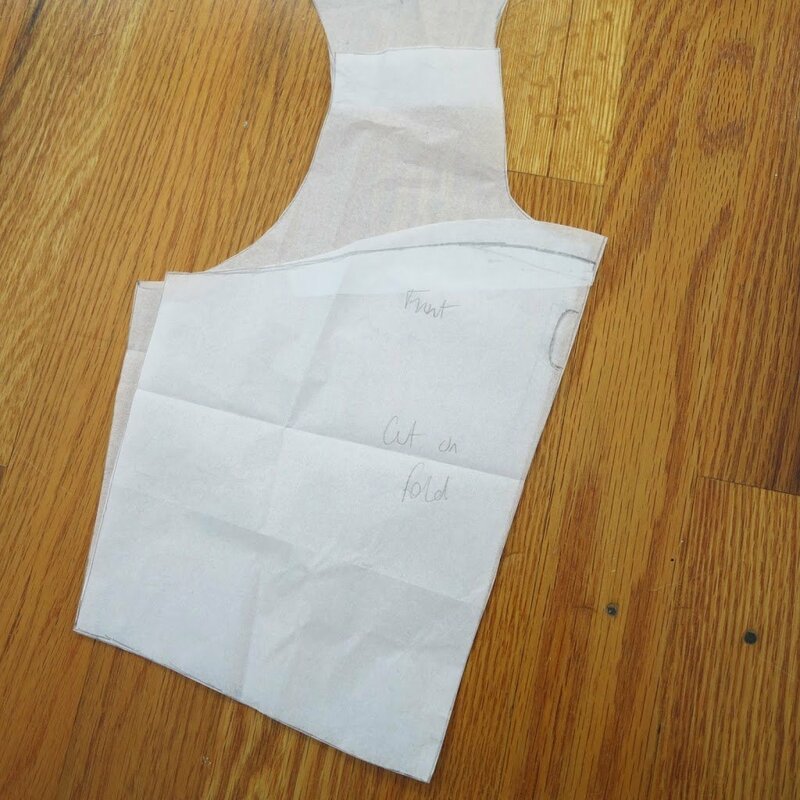 I then drew up the new shape of the bodice. I found that I had to bring the sides in slightly for the new (strapless) design. To work out how long the straps needed to be, I employed the use of some seriously scientific guesswork. I basically just did what you can see below. I measured from the shoulder strap to the middle of the buttonhole in a line that I imagined the straps would naturally be pulled into. 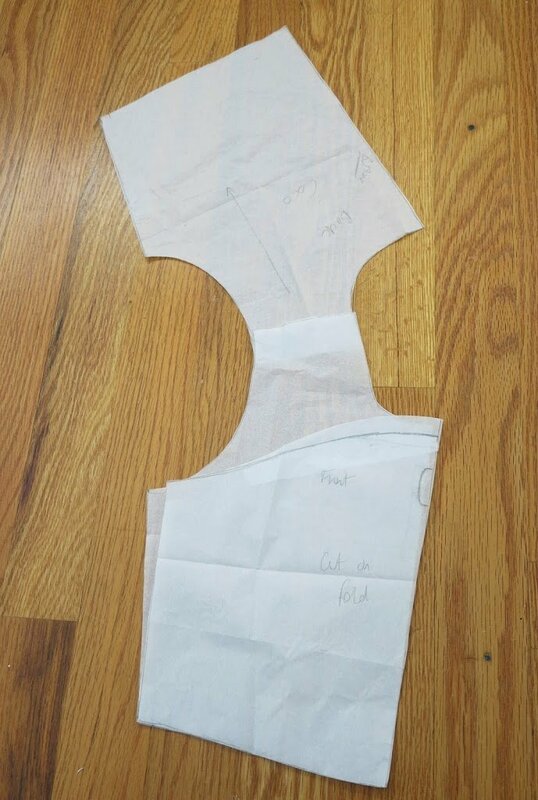 As you can see from the pattern piece below (my first draft), I initially failed to take into account the portion of the strap that would extend past the buttonhole to wrap around the bow. I ended up lengthening this pattern piece by about 1.5″ for the final dress version. And that is all there is to this design. It’s really very simple, but also so very cute. And I’m very confident that a certain person would have absolutely no problems in modifying a certain Two Fruits dress into a Mummy sized version. 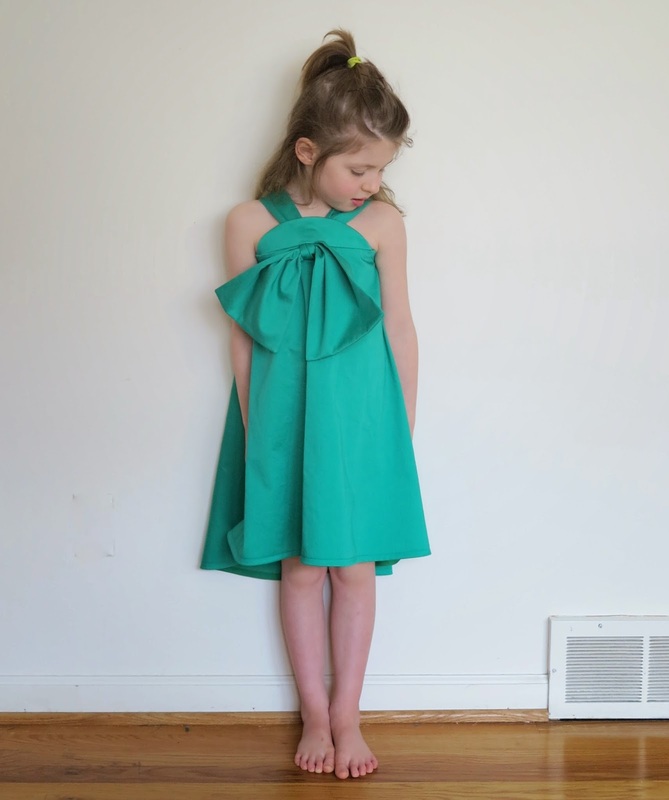 This entry was posted in cotton, dress, Mood, sateen, self-drafted, tutorials on April 1, 2015 by Debbie Iles. Shall we drop it again? The waist that is. Can I call this a drop waist skirt? Well, if I can, it’s so totally me! I made my first version of this skirt up a few weeks ago and I’ve been loving it to pieces ever since. This time, I jazzed the pattern up a little by adding a couple of cute front pockets. I also found a way to use up some completely and utterly amazing fabric scraps I had lying around. The way the skirt hugs the hips, and the addition of the front panels makes this skirt so much more flattering than a basic, gathered skirt. I’ve got plans to add a straighter, higher yoke option to this pattern that I might have to try out next. But here are some shots with a simple white top, which show the details of the skirt more clearly. In real life, I’ll be wearing this particular skirt with my favourite stripes, which is the main reason I designed that striped top in the first place. 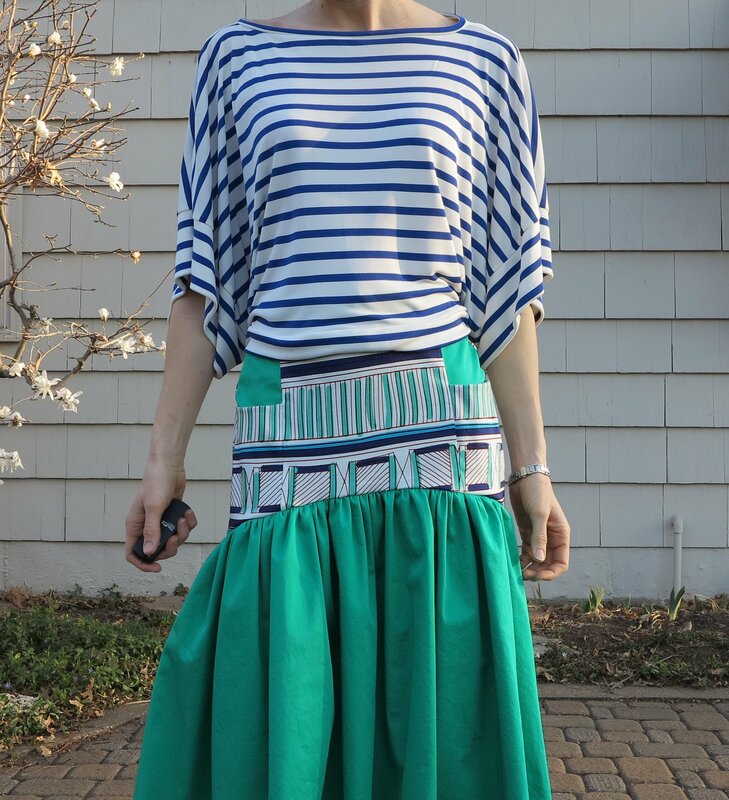 This entry was posted in cotton, Mood Fabrics, sateen, self-drafted, skirt, Tessuti Fabrics, top, viscose and tagged cotton, Lily Sage & Co Patterns, Mood fabrics, skirt, Tessuti Fabrics, top, viscose on March 24, 2015 by Debbie Iles. Can I call this a drop waist skirt? Well, if I can, it’s so totally me! I made my first version of this skirt up a few weeks ago and I’ve been loving it to pieces ever since. This time, I jazzed the pattern up a little by adding a couple of cute front pockets. I also found a way to use up some completely and utterly amazing fabric scraps I had lying around. 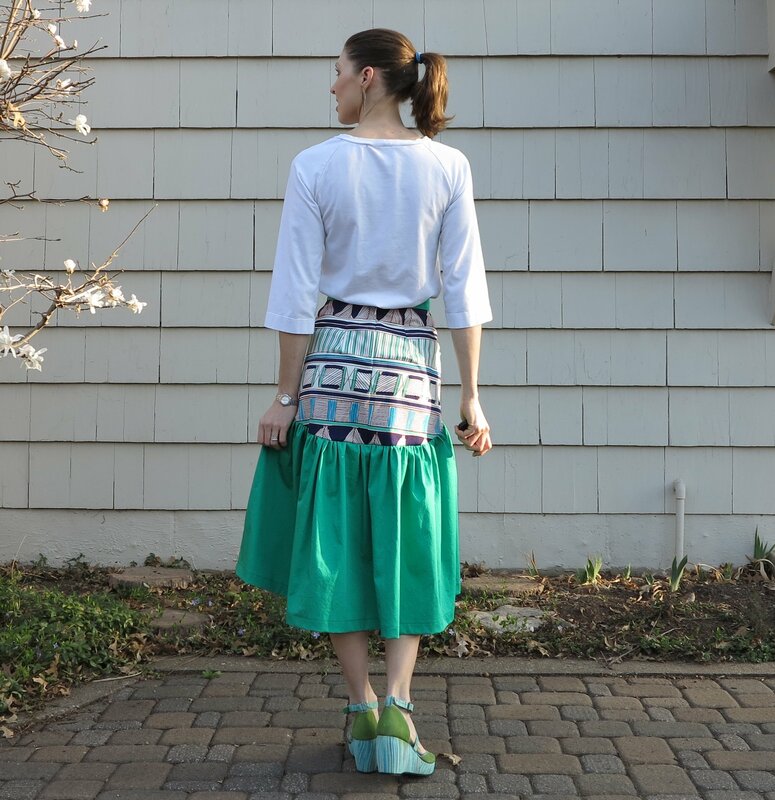 The way the skirt hugs the hips, and the addition of the front panels makes this skirt so much more flattering than a basic, gathered skirt. Here are some shots with a simple white top, which show the details of the skirt more clearly. In real life, I’ll be wearing it with my favourite stripes, which is the main reason I designed that top in the first place. 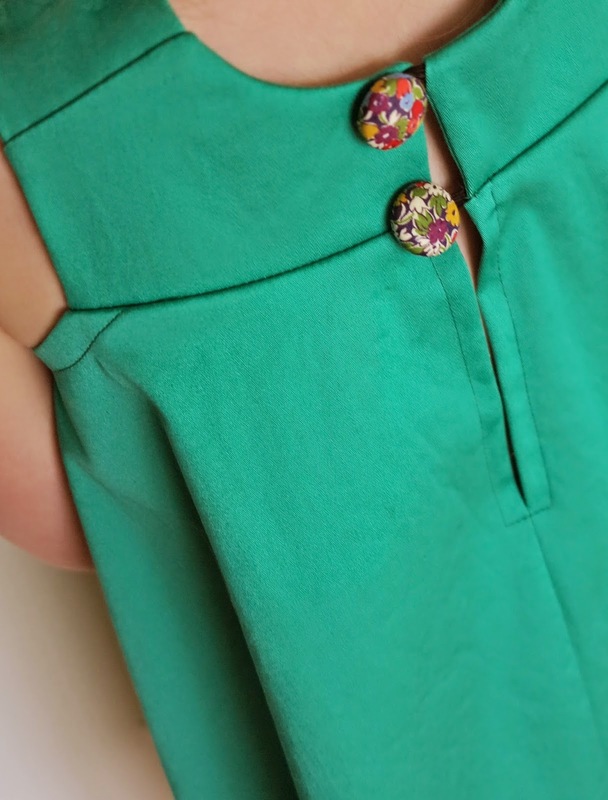 This entry was posted in cotton, dress, Mood, sateen, self-drafted, tutorials on March 24, 2015 by Debbie Iles. All I can think of when I see that glorious green is Emerald City from the Wizard of Oz. It truly is the most amazing shade of green, and in a great value cotton sateen to boot. 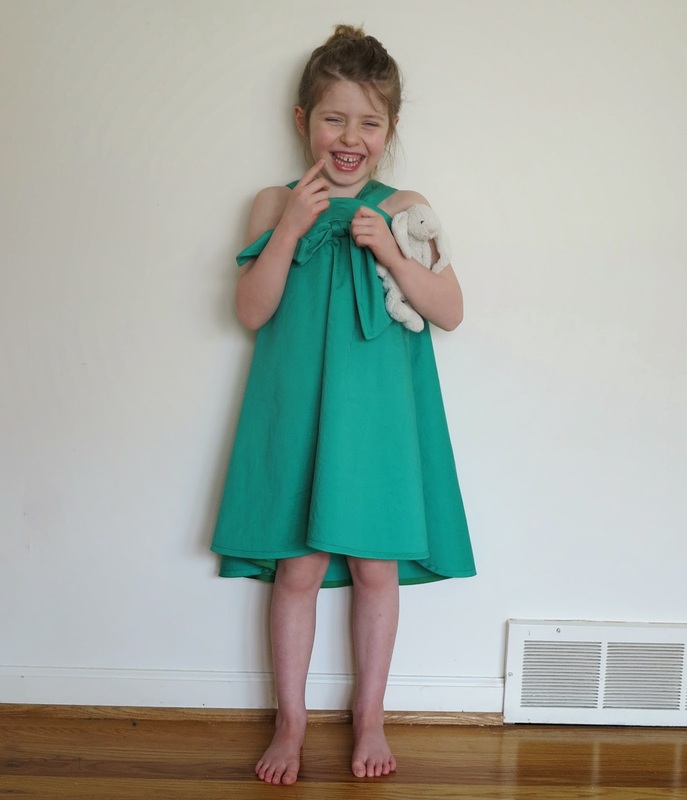 This is a self-drafted pattern, and it has a cute little front bow just like my last little yellow dress. I think the bow works beautifully with the style. I chose a medium/heavy weight cotton for my version because I wanted structure and body in the dress, but the style would work just as well in a lighter cotton or voile. Like all new patterns, this one still has a bit of work to go, but it’s already getting a big tick of approval from Miss Five. 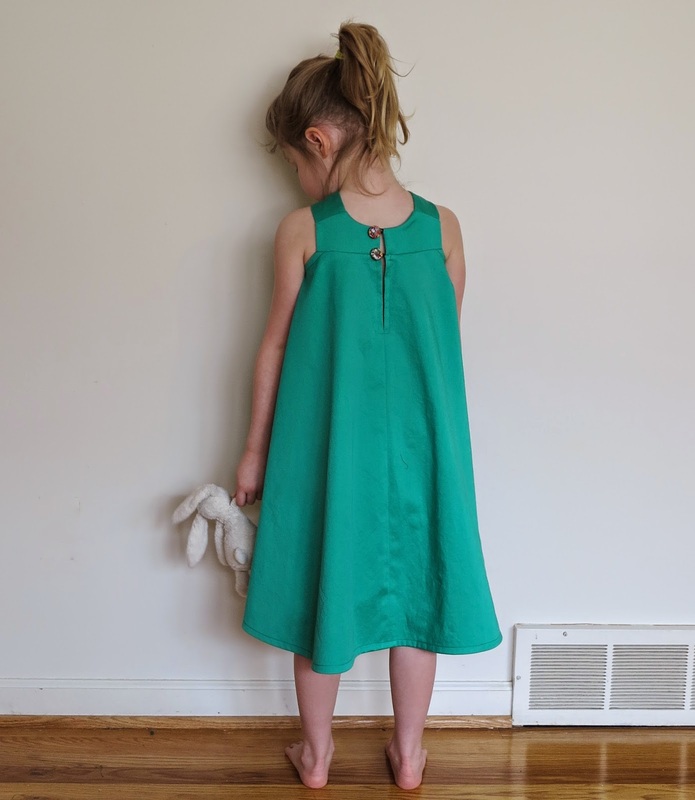 This entry was posted in cotton, dress, Mood, sateen, self-drafted on March 5, 2015 by Debbie Iles.